On 27th Oct 2010 SNEH celebrated the International Occupational Therapy Day. Dr Naina Christian the Occupational Therapist of SNEH was honored. SHe cut the cack on this occasion. To make the society aware about this profession and advantages of the Occupational therapy, SNEH and the largest circulating Hindi News paper Dainik Bhaskar come together. Bhasker published the detailed article about occupational therapy with the case study in which the kids got recovered. 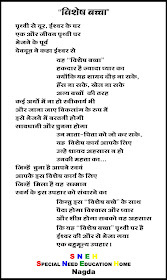 Thanks to Bhaskar for supporting SNEH in this noble cause. The Print and Electronic media is giving wide coverage to the SNEH activities to make people aware about the SNEH and its activities. 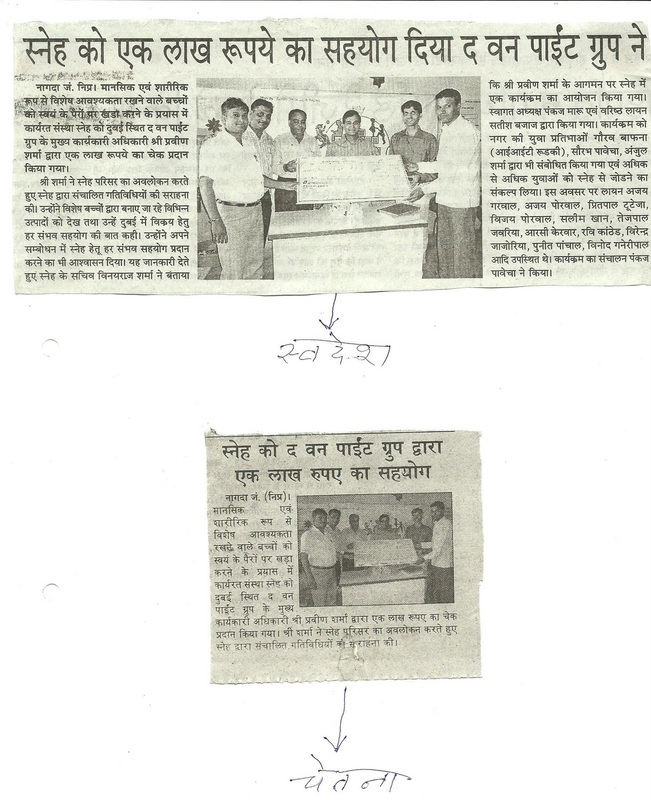 We are attaching herewith few of the NEWS cuttings of our recently conducted programmes. It was a great occasion for SNEH family when Sekhar Seshan, Executive Editor of well known financial Magazine 'Business India' visited SNEH campus on 19th Oct 2010. He was accompanied by Ms. Rituparna Mitra (corporate communication LANxess India) and Mr S.N. Sharma (Technical Head- LANxess India Nagda). The guest were welcomed by Master Sanyam and Baby Nikita of SNEH. 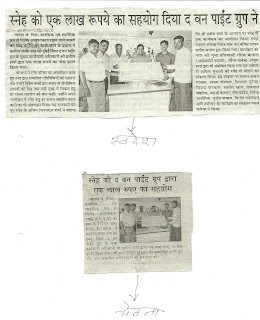 Founder & President of SNEH Mr Pankaj Maru explained the working of SNEH. 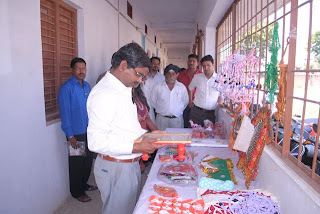 Mr Sekhar observed the vocational and academic activities. It has also been explained that how SNEH is making their kids self sustainable. 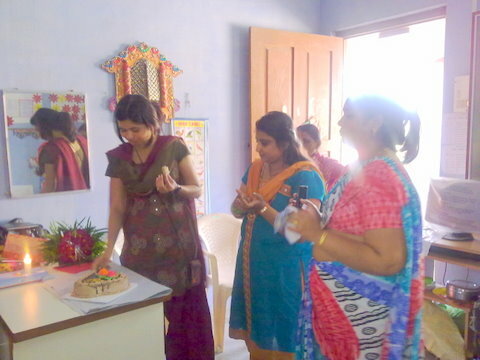 Occupational Therapist Dr Naina Christian explained them about the assessment procedure and therapy. Mr Seshan showed keen interest in understanding the various activities of SNEH. He commented "very dedicated team and a great work done" in the visitor's book. Mr Vinay raj Sharma & Mrs Taruna Maru were also present on the occasion. Mr Praveen Sharma, C.E.O. of the One Point Group Dubai and Founder of www.viewbestads.com visited SNEH campus on 17th Oct 2010 during his India Visit. He minutely observed the each and every activity conducted by the SNEH. He handed over a cheque of RS. One Lac to SNEH. HE was welcomed by the Founder & president of SNEH Mr Pankaj Maru & Director of Lions club Nagda Greater Lion Satish Bajaj. He said that he is ready for any type of contribution for the SNEH. 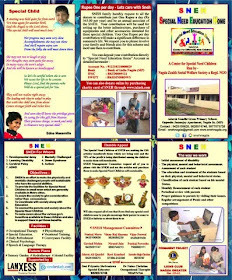 He also convey hios wish to create a good market for the articles made by SNEH kids in Dubai. 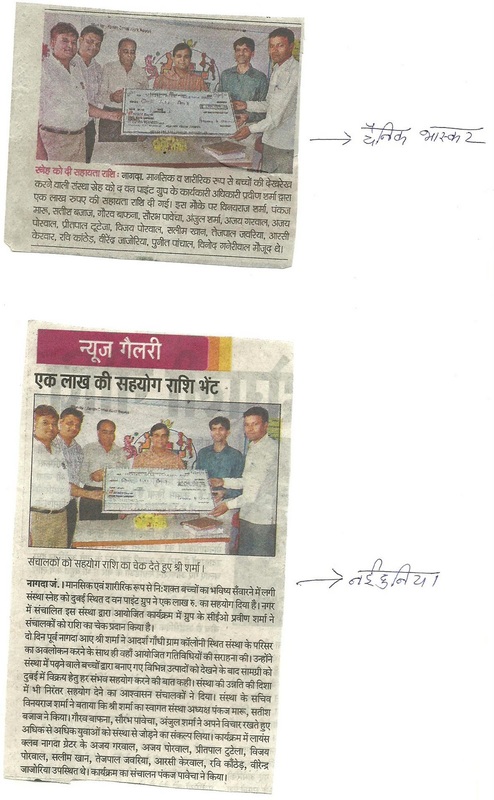 IIT Roorkee Student Gaurav Bafana also extended his wish to contribute for the SNEH by way of making society aware and specially youth about the activities of SNEH. Mr Sourabh Pawecha, and Anjul Sharma an MBA & Engineering student respectively also extended the same feeling. Lion Vijay Porwal, Lion Ajay Porwal, Lion Ajay Garwal, Lion Preetpal Tuteja, Lion T. Jawariya, Lion Vinod Ganeriwal, Lion Ravi kanthed, Lion R.C. Kerwar, Lion V. jajoriya, Lion Nirmal Jain etc were present on the occasion. Pankaj Pawecha conducted the program and Vinay Raj Sharma extended the vote of Thanks. 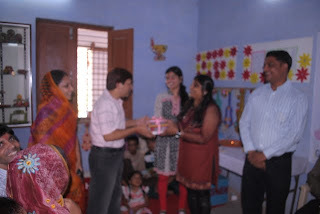 3 yr old Priyanshi Rathi celebrated her 3rd Bday with SNEH kids on 16th Oct 2010. 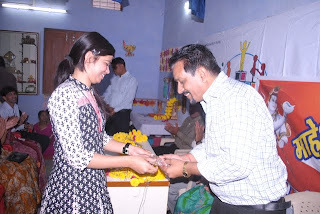 Her father Manoj Rathi (Bardana) visited few days back in the SNEH and conveyed his wish to celebrate his daughter's bday in SNEH. He is doing such activities every year on the occasion of Priyanshi's Bday. 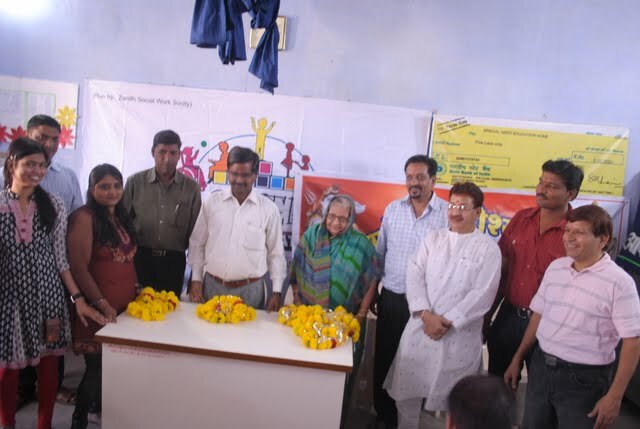 He handed over a cheque of Rs 5000.00 to Dr. Naina Christian of the SNEH. Kids enjoyed the bday party. Maheshwari Social group Nagda's President Mr & Mrs Manoj Lathi, Mr Jhamak Rathi, Mr Gopal Mohta, Mr Rakesh Kochar were present on the occasion. Mr Vinay Raj Sharma Secretary SNEH conducted the program and Pankaj Maru extended the vote of thanks. SNEH wishes all the very best to Baby Priyanshi for her bright and prosperous life. 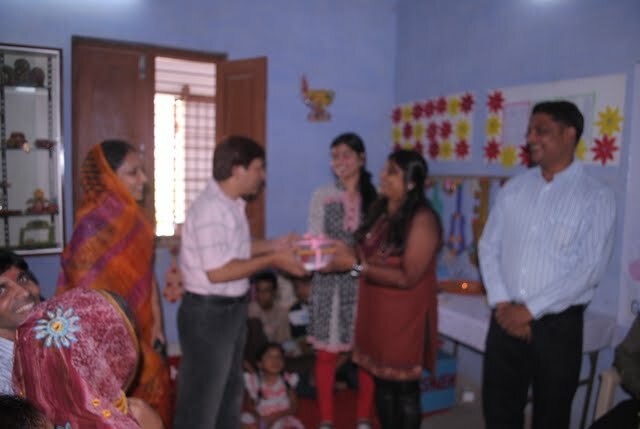 Lion Jhamank Rathi (Member of Lions Club Nagda Greater and Maheshwari Social Group) Celebrated his B'day with SNEH Kids and member of both the social organization.. His mother Mrs Snehlata Rathi W/O Late Shri DamodarDas ji Rathi gave a cheque of Rs. 5100.00 on this occasion to SNEH and committed to give the same amount every year for SNEH. 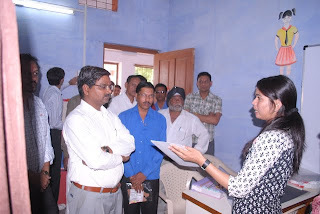 Founder Pankaj Maru enlighten on the object of the SNEH and share the annual membership scheme of Rs. One Per day. Tehsildar Shri Ramswaroopji Jaiswal liked the activities of SNEH and ensured for all necessary support to provide the Govt Land to construct SNEH's own building. 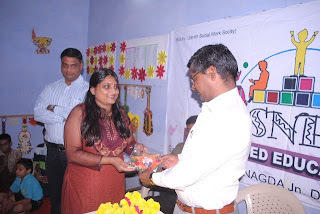 Maheshwari Social Group Nagda's President Mr Manoj Lathi also appreciate the activities of SNEH and he himself become the annual Donner Member of SNEH. Lions President Lion Santosh Kolan committed that Lions Greater will continue to support this project as its permanent project. Lion laiq Ahmed Ansari, Lion T.P. Jawaria , Mr Sanjay Dangra also become the annual Donner member.Special Educator & Vocational Trainer of SNEH Mrs Priyanka Shrivastava shown the vocational activities and Dr Naina Christian explains the Occupational Therapy system to all present. SNEH's Managing commitee Secretary Vinay Raj Sharma Extend the vote of thanks. 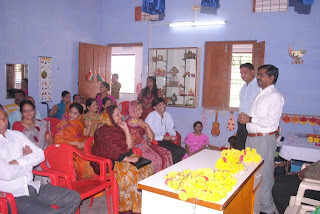 Program was conducted by Pankaj Pawecha. Narendra rathi, Lion Nirmal Jain, Ashok Bisani, Ajay Garwal, Vijay Porwal, Ajay Porwal, Lalit Khandelwal, Ashok Porwal, Ashok Saklecha, Preetpal Tuteja, R.C. Kerwar, Raju Malpani, Avinash Gupta, Pawan Rathi, Manoj Rathi (Bardan), Ajay Rathi, Rajkumar Mohta, & Ajay Maheshwari were also present on the Occasion.